A little over a year ago, I tore my ACL playing ultimate frisbee. I made a quick cut to lose my defender, and as I planted my foot to change directions, I felt a sudden pop in my knee. Next thing I know, I’m on the ground because my knee had given out. I had surgery to repair the injury three months later. After the operation, I was surprised when I received an itemized list of all the surgery expenses. Without any digging whatsoever, I was handed a detailed snapshot of what the surgery costs! Everyone knows that U.S. healthcare costs are through the roof, but where does that money actually go? I examined all 68 entries on my medical bill to try and decipher what accounts for the cost of an ACL reconstruction. The ACL runs through the middle of your knee. You can think of it like a taut strand of rope which helps stabilize the knee. Once the ACL tears, it’s as if the rope has torn through the middle and frayed on both ends. At that point, the ACL will never heal on its own. The only way to fix the ACL is to replace it with a new tendon. The process involves getting a replacement tendon, cleaning out the old ACL, and then stringing the replacement into the same ACL channel. Finally, the new ACL is screwed in to the bone on either side. 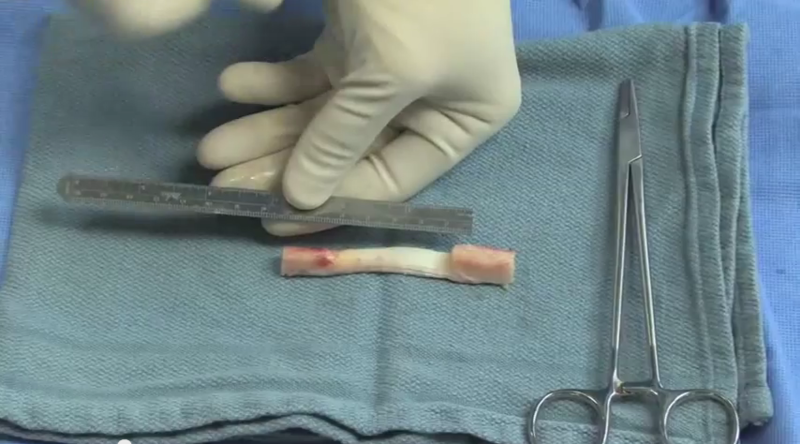 A patellar tendon graft from a live surgery video. It’s a little piece of tissue, roughly the length of your finger, which comes from right under your kneecap. Those bits on either end are ‘bone plugs’. 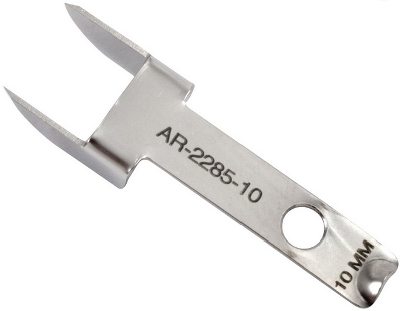 They are cut out of the bones in your knee and help secure the replacement ACL. You don’t have to use the patellar tendon though, some people opt for taking a chunk of their hamstring instead. Other folks even use another person’s Achilles tendon harvested from a cadaver! As much as I dreamed of having the tendons of a deceased NBA player, my surgeon recommended that I use my own patellar tendon. It’s the graft he preferred for surgery, and the one he had seen the most long-term success with. The replacement tendon gets inserted into the knee and strung into place to act as the new ACL. After the procedure is over, it takes about 3 months for the bones to fully fuse and the new ACL to revascularize. The whole rehab process takes about 6-8 months. 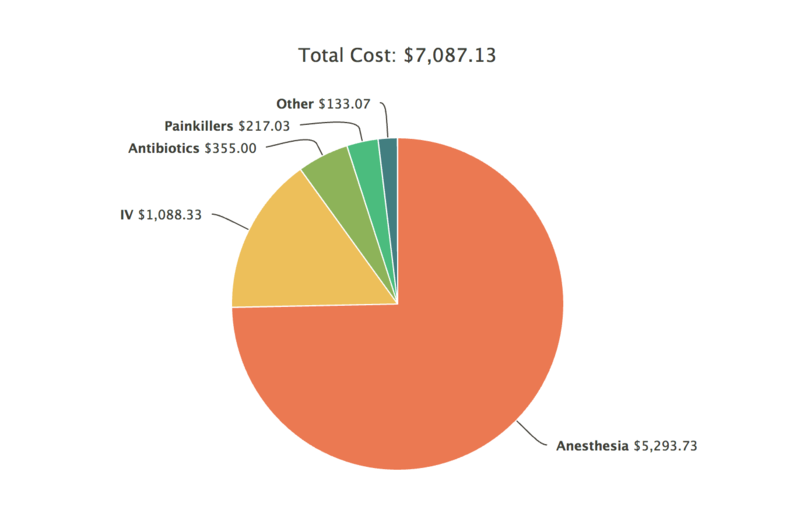 To get a better idea of where the surgery costs come from, I’ve included the overall breakdown below. These are just the costs from the day of surgery itself. I’m not counting MRIs, physical therapy, or extra medications. Looking at that $68,000 price tag, it’s readily apparent why there’s so much money in medical supplies. As a lay-person, I have little information to base that figure on. There’s not a lot of information out there about the total cost of surgery, though out of pocket expenses average a little over $2,300. According one source I found, the total cost should be between $20,000 and $50,000. Based upon that figure, my total cost is pretty far north of average even though my out of pocket expenses were a bit below (possibly because I had the operation in California). Going in, I had anticipated that doctors would take the lion’s share of the costs. 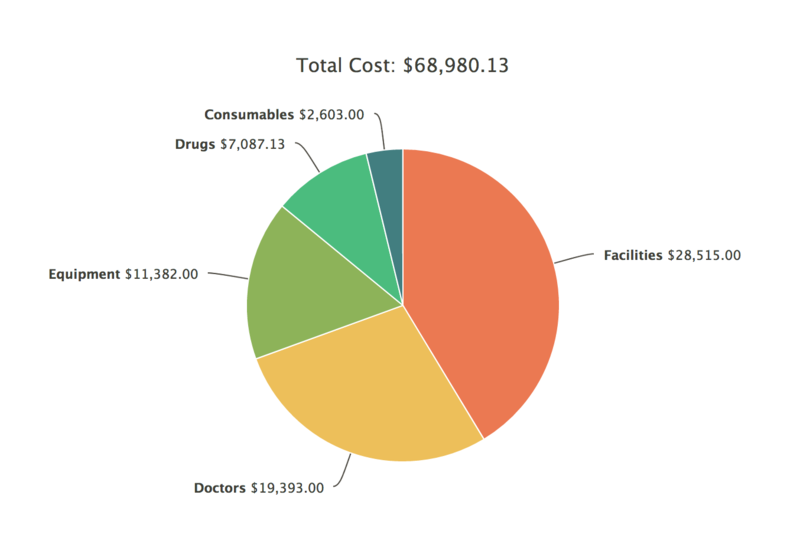 I was surprised when the facilities ended up being the dominant cost; over 40% of the total. Looking at the bill breakdown, there are four places where I was billed for time spent at the facilities. Those are some pretty staggering numbers when you think about it. The cost per minute of being in the operating room with the staff on-hand is nearly one third the cost of space tourism! In fact, I can’t think of many other venues or activities which can even come within an order of magnitude of that cost. So what accounts for the cost? My med school friends tell me that hospitals will over-bill the insurance for these sorts of things “because they can.” Apparently a lot of the cost will cover other parts of the hospital operations, like staffing and management expenses. Presumably a decent amount also covers the insurance in case something goes horribly wrong during the procedure. There’s also the costs with cleanup, keeping everything sterile, and the cost of monitoring the entire procedure. As you might expect, the surgeon takes the vast majority of the personnel costs. The fees are more or less based upon the difficulty of the procedure. Meniscus Fee: The meniscus is a piece of cartilage which sits right below the knee; you can of think of it like a shock absorber. Repairing a torn meniscus either involves sewing the cartilage together, or sanding it down. In my case, sutures were used to tie the cartilage together. Arthroscopy Fee: The knee arthroscopy is something I would’ve required with or without the meniscus repair. 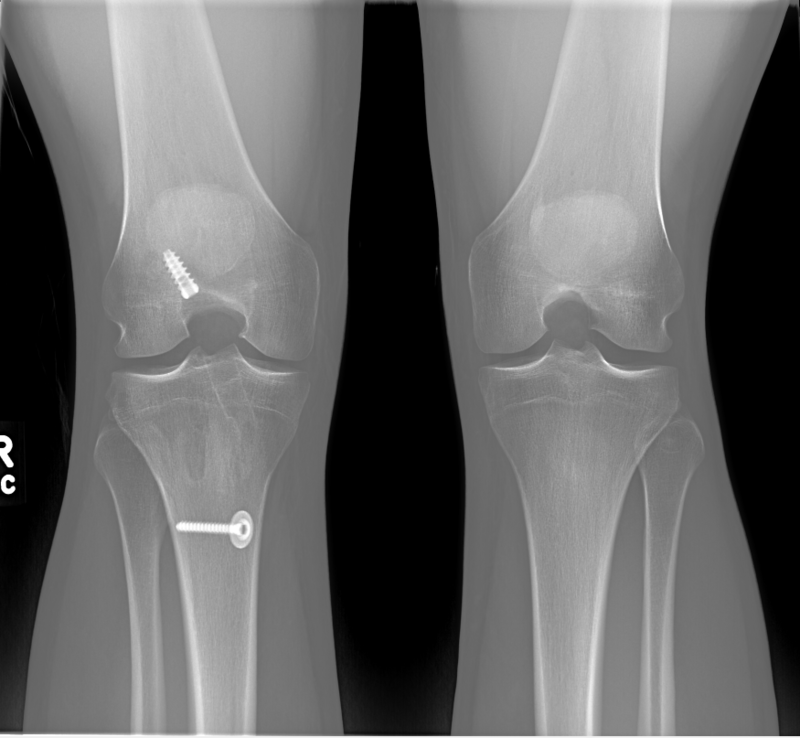 It’s the process of drilling holes in the sides of the knee and monitoring the procedure with a tiny camera. I’m unsure why it cost the same amount as the meniscus repair, which presumably requires a bit more finesse. ACL Repair Fee: Since the ACL reconstruction is a much more complicated procedure, it accounts for the majority of the cost. It doesn’t seem to vary based upon where the graft comes from. Apparently cutting out the patellar tendon just gets bundled into the whole ‘ACL repair’ cost. Categorizing the equipment was a bit trickier, since I have little idea of what most of it does. Most of the cost came from a cannula fast fix, which appears to be a series of tools used for drilling out and repairing parts of the knee. The most grisly of the equipment items was a knife specifically designed for cutting out the middle third of my patellar tendon. The knife used to cut out the middle third of my patellar tendon. This centimeter-wide cutting machine cost $900 according to the price sheet. Surprisingly, the least expensive item of the equipment was the drill bit used to put holes into my bones for the new ACL. At just $100, the 2x127 mm piece of metal was practically a steal. I assume the low price comes from the fact that the drill bit can be used in many different kinds of surgeries. It’s easier to mass produce than an item like the knife which serves only a single function. These items appear on the price sheet because none of them ever get re-used. They were bought specifically for my operation. I’m told that surgeons will re-use handles for their medical supplies, but the blades get thrown out after just a single use. The vast majority of the the drug cost came from the general anesthesia administered by the anesthesiologist. Unfortunately, it wasn’t broken down any further than a single line in the cost sheet indicating the $5,000 price tag. Most of the other drugs cost between $40–60 per dosage. The largest outlier was the “Epinephrine in Lactated Ringer’s” solution with a hefty cost of $998.04. The epinephrine was used to keep my blood pressure up during the operation, while the Ringer’s Solution was used to replenish lost blood intravenously. The most interesting aspect of the different drugs I was taking was the range of responses they were designed to get from my body. There was Lidocaine: a local anesthetic to numb the pain of the sedative Propofol. The Ondansetron was administered to keep me from vomiting. The Midozolam induced a case of mild amnesia before the procedure. All told, I was given a total of 14 different medications. Of the listed medications, only Fentanyl and Oxycodone fall under the category of Schedule II controlled substances. These are drugs which have a “high potential for abuse” and are only allowed for medical use. Winning the award for the most outrageous expense were the two 10ml vials of saline solution. Total cost: $90. While I’m sure that keeping the solution sterile does have an extra cost, $90 feels pretty steep for something I would’ve made as part of my high school chemistry class. Last but not least were all the consumables that were put into my body to support the new repairs. There weren’t many surprises here, other than the consistently high price for the materials. As you might expect, the sutures cost less than the metal pieces, and the smaller metal pieces cost less than the larger ones. My x-rays, complete with two screws and the washer. So there it is: my $68,000 dollar operation. And it isn’t even on the high-end as far as medical treatments go! Cancer treatments can easily exceed hundreds of thousands of dollars in cost. About the costs I didn’t mention; all of them were just a fraction of the surgery itself. The most recent MRI bill I received amounted to $4,446 for the equipment and diagnosis. I went to approximately 30 physical therapy sessions to regain my strength and range of motion, totaling $3,000. These costs were also heavily subsidized by my insurance. It’s clear to me that this is an industry which needs serious innovation. I’m glad companies are building medical equipment, but most of these supplies seem incredibly overpriced. And if you don’t have insurance, you’re really going to be in a bind. Kudos to all you medical startups out there, I wish you guys luck.